In 1986 landowner Ruth Neumann donated a conservation easement to the newly formed Door County Land Trust, with the faith that the property would be permanently protected for the future. 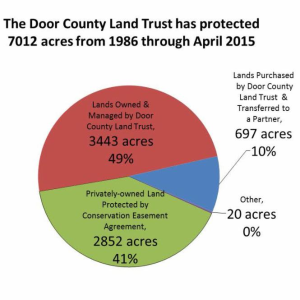 Since that first parcel, the Land Trust continues to accept conservation easements and land donations and purchase properties of high scenic and ecological importance. With the Land Trust’s most recent purchase, a 40-acre addition to the Three Springs Nature Preserve, we have now surpassed 7,000 acres of protected property!